I bought his app a few years ago and have been impressed by not only the quality but the dedication of the developer. This is honestly the best iPad sculpting experience I’ve had and honestly the closest thing to zbrush that you’ll get on the platform. 10/10 I would absolutely recommend this app for any 3D artist using a mobile device. 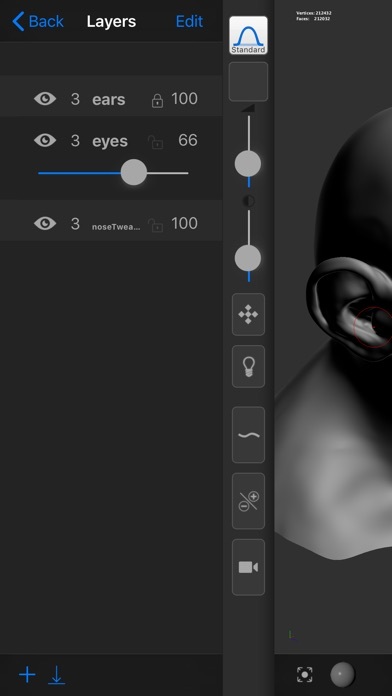 This app is great for touching up ZBrush models on the fly. I’m having an issue when mirror with the “Mirror” button. Selecting an axis in the drop down mirrors my brush, but using the labeled button and selecting X-axis crashes the app. I’m trying to mirror my mesh for eyes and can’t figure out how. Thank you. 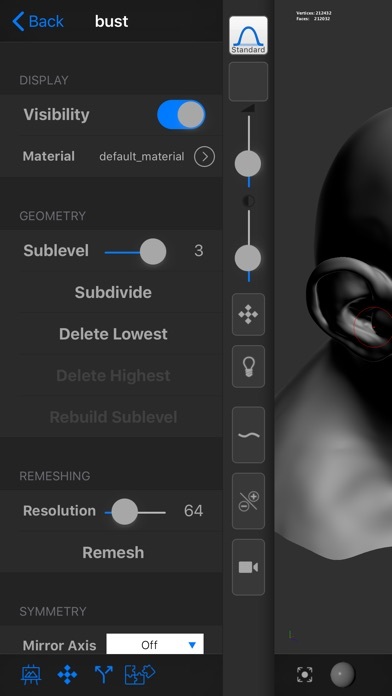 Best sculpting app for the iOS. 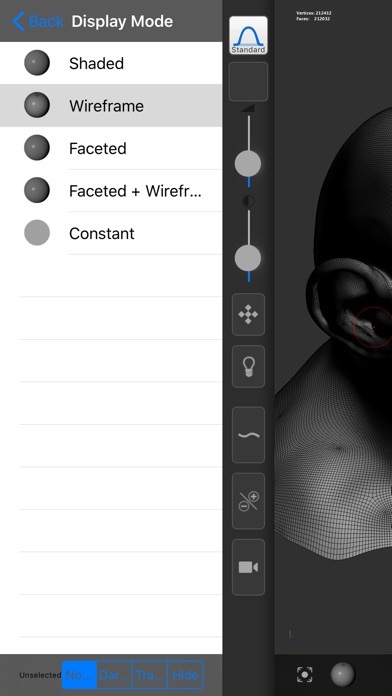 Developer keeps dropping updates that makes this app the most versatile sculpting app out there for the iPad. Performance is smooth and features a great tool set. It’s the closest thing out there to Zbrush on the App Store. Keep the improvements coming! This app doesn't have it all, and is not as intuitive as I would like. But, it is THE app I use to sculpt on the go. I like Putty3D, which is fun for concepts, but really impossible to transfer to any other program due to the way it creates your model. Pretty much useless except for ideas. Forger on the other hand has been great sending files to Maya with Dropbox. I was actually able to take there base head mesh into maya and make it water tight by closing up the neck and mouth, send it back to Forger with Dropbox and use that to sculpt 3D PRINTABLE MODELS on the go. Really really cool. Exactly what I was looking for :) So all in all, it could be better, but it offers some great functions and tools that allow professional techniques and workflows. Seriously developers going to rate 1 star why u ask? Well forger is not working since summer so am rating 1! I was looking for a long time to find a mobile sculpting app for iOS that was comparable to Sculptris or zbrush....now, obviously this is no zbrush, but it is the close seat I've ever seen on a mobile device! You can subdivide 6 or 7 times, add new spheres to give yourself more "clay" to work with, and switch between many brushes. This is an amazing app and easily blows 123d Sculpt out of the water. I'm using an iPad Pro and have never had trouble with lag in this new version, it is honestly more enjoyable to sculpt in my iPad with forger than it is on my desktop with Sculptris. If you're looking for a fairly serious 3D sculpting experience on you iPad, this is the app you want! I'm a 3D artist and when I found this app for $3 I thought I'd give it a shot. I found that it was a very powerful app that works much like Zbrush but for a fraction of the price tag. The app functions more as Zbrush and not Maya, meaning that you are working with a model like you would with a clay sculpt. For me when I am on the go an want to work on my models. I can import them from DropBox and export them later. For more or less, this App turns my Ipad into a Wacom Cintiq Compaion runing Zbrush. The brushes are nice and the UI is okay. But there are a few problems with the app that I feel need to be fixed. The first is the fix lighting in the app. With the light stuck in one location, you will have to move the model around inorder to get better lighting. Now if you could move the lighting or if it that a proper three point lighting system, that woudl be great. Another problem is that you can add on stuctures to a model you a working on like in Zbrush and merge them giving you more room to work with just by adding basic shape models to a model you are working with. Lastly is the placment of some the the tools in the IU, mainly the masking tool, the Masking tool is in the brush section and the buttons to edit the mask (clear mask and invert) are located in the display tab when they should be with Mask tool in brushes. Another problem is the fact that it crashes when you try to use the wacom stylus via blurtooth, but I let that slide as that is a problem that has happened with many apps after the lastest IOS update. And Wacom needs to fix thier SDK for that. In short this is an amazing app for IOS that is able to turn your Ipad into a Wacom Cintqi Compainion with Zbrush for only $3 (not counting what you payed for your device) vs $3349. Just need a few touch ups here and there. The sculpting engine is really nice and it's the closest to zbrush I've found. But there are so many bugs. The settings drawer once active, stays open. How do we chose this? Also the model can become inactive and I didn't see the option to choose the canvas. Please continue support for this!!! Could be so good. I love the touch navigating and sub dividing. Please contact me I would love to help you keep this going. the reason I gave this one star is because it's a BIG waste of money. You can barely do anything with the clay and it's very hard to control. 😡 DO NOT BUY. I have to be honest, I wasn't expecting much from this app because I hadn't really heard of it before. I took a chance and bought it and I'm really glad that I did. There are some pretty impressive and useful features here! I do wish there were a way to paint directly on my sculpture instead of just changing the color of the material. Also hoping that in the future there will be a way to create a rigging for a full body instead of just starting with a sphere, cube, etc. With these additions I could do a complete sculpture. Right now I feel like it's a good place to start a project but that project ultimately needs to move into another program to be finished. All-in-all, I'm pretty impressed and enjoy using this app! The future has arrived in my mere pocket. The Retina display makes this possible. Even has subdivision levels. Brushes fully adjustable. I want to add exclaymation marks to these sentences. The modifier buttons offer two handed or careful two finger quick smoothing and even lighting direction change to highlight your relief area better. BUG: zoom with two fingers is funky. Hardly works. The Home button helps get me a useful view at least. The quick tutorial shows three fingers seemingly on the wrong command. Needs a maintenance update. Works on iPhone 6s iOS 10.1.1 despite this zoom hassle. Ah, zoom works better when I really move two fingers out drastically, so there's a threshold effect for this action. I'd prefer immediate fine control. Also, it's quirky enough that brush action kicks in as I'm just trying to zoom as one finger lifts off before the other. Please fix this utter deal killer. Other 3D apps have no such problem. I can't zoom in and out as I work and having to undo massive damage destroys my flow state of just sculpting. Even toy level app iDough readily does zoom/rotate simultaneously without invoking a brush. BUG: double tapping to keep the smooth brush down invokes the rotation locking modifier. BUG: the rotate gumball tool disables view rotate, meanly. So, I've spent about an hour working on a model. I decided to take a break. I come back seeing that my model is just a default sphere. I try again. Still doesn't work. I try it about 10 times more, and it never works. DO NOT BUY THIS. IT IS WORTHLESS. When i click on a thing to sculpt, it crashes right away and i just downloaded it. Please fix this ASAP. Seems all right but on my 5th gen iPod touch the camera controls are glitchy and I can't get any smooth control. Just what I needed as a little modeling travel companion. Thanks. Thank you so much for adding the update. I am now fully able to play the game without crashes on my iPod touch. I just have one request: on the next update, please try to add a feature that allows me to save and access my creations. Thank you! 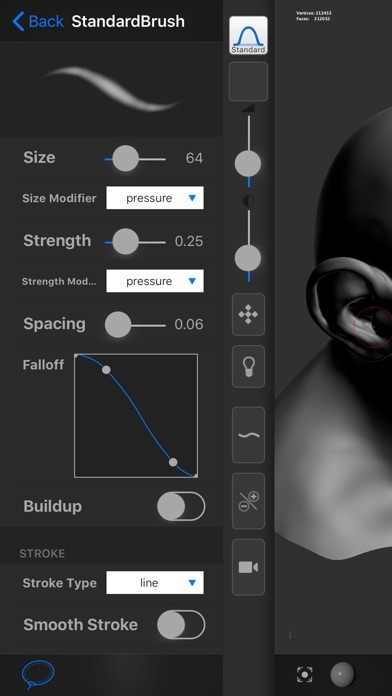 Love this app, it mostly works well and is very powerful for mobile sculpting. 1 issue. For turntable export, it wants photo access but ios doesn't seem to notice the request, so it can't be granted! Good to kill some time .Interface needs to be fix. Honestly I wasn’t expecting the app to be so great. This is first time in my life when I was sculpting in 3D, I spent about 1,5 hours to create a nose I wanted and almost finished with face shape (thanks for the face template). It might sound a lot of time, but it’s actually very fast, compare to the computer and I had no experience. Super smooth app, all instruments on the side, I customized them a little bit and was ready to go. I wish the app will have an option to paint my work after I’ll finish, to make face look more realistic, maybe it does, but I didn’t found it. If you have no experience, and you have Apple Pencil, definitely worth buying! Great job developers! This app doesn't work. Only crashes. I thought this app was going to be great but it just crashes and every time i pull it up it says this is the first time forger has been opened would you like to see the tutorial? It's such a let down a waste of money. I tried using it like I would clay to sketch out my future projects but it was very laggy and bad in general. I would not recommend buying this app. 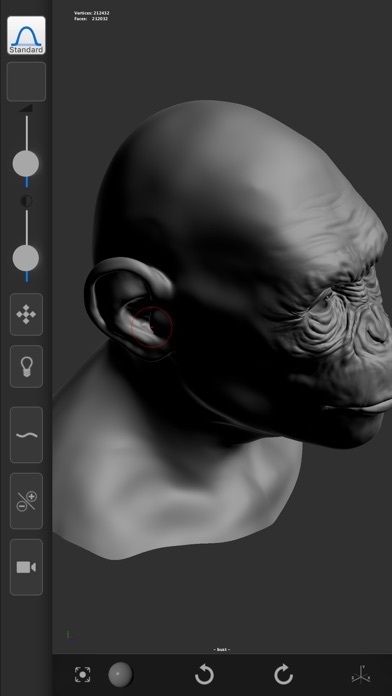 This app has all required tools and functions, for mobile/tablet devices, to sculpt on the go. - Face, body and basic geometry to start with your project. - Standard, clay, flatten, inflate, move, pinch, crease, smooth and other essential brushes. - Subdividing, working with higher or lower subdivision and remeshing up to 128 res. - Symmetry, translate, scale, rotate options. - Masking and selection tools just like ZBrush. - Layers, option to edit/create materials, change light position. - Option to export as obj and use dropbox within the app. Had no issues or bugs on my iPad Air 2, except when zooming in with two fingers sometimes. Good job developer and keep the good work going. I have retracted my initial negative review of this app, and would like to say, though I believe it still needs slight adjustments, it is by far the best sculpting app in the App Store. Period. With some slight adjustments regarding ease of switching between brushes, it could be INCREDIBLE! Keep it up! I would definitely recommend it, and would download it again! Thank you. Very deep app. Has a lot of very well that thought out tools and the interface is great after a bit of studying the manual. Apple Pencil support would make it even better. At first look it seems like this would be a great mobile sculpting solution. However, there are so many bugs that make it completely useless and aggravating. I'm sure it's fine if you want to dabble in the 3D sculpting realm, it's not particularly pricey, but it is most definitely not mobile ZBrush. Hello, I recently bought your app Forger and I am very inoressed with what you have brought to IOS, congratulations on being the first! Here are a list of suspected bugs and subtle improvements I would like to see implemented. Although I am using Iphone4s with IOS7 and this could be why. Bugs:Can't view mesh properties tab, unless you have more than one mesh added to outliner and visible, the smooth shortcut button is not showing up on the side bar, Suggestions: needs to have a tool drawing offset of 60 pixels on the Y(xcode point of view, not 3d space Y) so that your own finger does not block your view when using brushes, this feature can be seen in Artstudio for ios which is the closest i've seen and app come to Photoshop, and is editable in the settings(adjust x, adjust y), make undo/redo buttons larger and positioned in easier spots and seperated, maybe bottom left and bottom right corners of the screen. That is all I have, thank you for brining sculpting to IOS! I spent 3 dollars on this and it shows nothing? Wow, you know how to make somebody say the word "rip-off"
This app is off to an amazing start and has huge potential for the future. It has almost all the standard tools that you would find in zbrush or mudbox. The navigation is gesture based and has a very logically laid out UI. As someone who uses Zbrush professionally and daily I have to really congratulate the developer for making a great iPad sculpting app and at such a good price. Keep up the great work!! I don’t know how to sculpt in 3D at all, so it could be just me, but some thing in this app seems like it’s missing or just annoying to do. Like how do I select and delete part of an object? How do you select and move an object? There are many different tool but not the most common one. Like I had to look in the mesh menu to find a way to turn of symmetry. Why? Love it!!!!!! Amazing!!!! Worth 100 times the price. Looking forward to future enhancements! Where’s the new color option? I like this app. Used to be free ones like it. But I’m ok with paying a little. I paid an extra $1 for color and texture but the option never appeared even after “restore purchase “. PLEASE FIX! Thought I had already rated and reviewed this. Whoops.. Anyway. Brilliant application! And the latest update that has introduced a new painting feature is extremely welcome. Definitely looking forward to what the future brings. This is finally starting to feel like a mobile version of Zbrush albeit with a lot less brushes etc. (something I do hope will change over time) however despite that, the app works very well and you can see the developer has worked very hard to keep performance in mind. I’d say the ease of use of this app is decent. But you’ll likely need to read the guide which is included to fully understand how to use the app and it’s features. Overall, very impressed, keep up the great work and I genuinely hope to see this application blossom further with more brushes and other nifty features. You can definitely get things done with this app unlike the very select few other modeling and sculpting apps available on the store. And again, whilst they do work (some of them anyway), the new painting feature blows them all out of the water when it comes to sculpting and texturing. In short, I think this has the potential to be the real go to mobile app for sculpting and texture / color painting if its development continues like this. So consider buying it to the support the developer and the further development of the app. This is one of the best sculpting softwares out there- the update has created a bunch of setbacks. Things are getting stuck, certain menus won’t open etc. Def not operating smoothly in UI/UX. Needs work there, and we need quick fix for the stuff the update tossed off. Second, where is the option to turn the grid off? We need a simple single button that allows us to toggle the background grid on and off. I no longer see the grid options in the settings. Also after the update the software is not picking up Apple Pencil input well, and the global pressure curve should most definitely not reset every time we reopen the software. The global curve needs to saved to whatever we set it at so it does not go back to where it was every time we open to work. If you guys get this stuff fixed you have a fantastic software- and really the only software for IOS that is a pro grade sculpting software. However, these performance and UI setbacks are big. Must evolve your development and UI skills to a new level. So far this is a great little app...I wouldn’t say it is a Zbrush but so far it is defiantly close to sculptris, can’t wait to see if it already supports alpha brushes or if it will in the future...It is definitely a tool worth it for the sculptor on the go. With several emails from the developer I was able to work through some quirks; I’m glad I did because this is a robust, powerful application. I’m the “read the manual” type of person but I was guilty of jumping right in to something new and shiny, so take my advice and READ THE HELP NOTES. Having said that, there are a couple things that weren’t obvious but we’re made clear by the developer: PAINTING: I didn't understand how the modeling and painting were handled autonomously. You must first export your model then when reloading there is the option to continue modeling or to paint. MULTIPLE OBJECTS: When I began painting, I couldn’t understand why only certain polygons were taking the color. Under the OBJECTS tab there were both the original edited model as well as the identical mesh for painting (each has a unique icon). After deleting the original mesh everything was peachy. Many thanks to the developer for all of your assistance.